Transworld graciously allowed me to share the interviews and pictures that I drew from on my humble blog. Here is part five with United Shapes' shaper, Steven Kimura, edited sparingly for spelling and clarity. Gray Thompson, just chillin' at the shape shack. 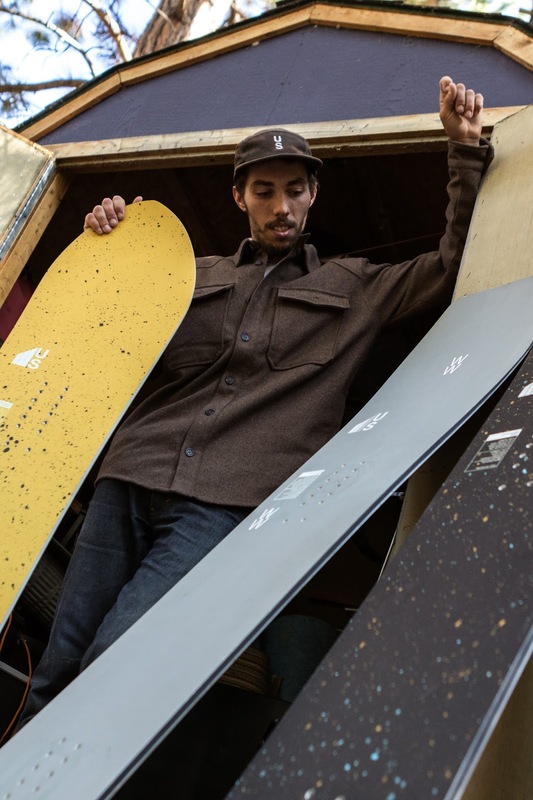 Steven Kimura: United Shapes is an independent snowboard brand producing innovative, cleanly designed, fun snowboards to make your time on hill even more enjoyable. Whether you are a seasoned backcountry rider, park rider, carver, or are just finding your groove in snowboarding, we offer a range of boards with a finely crafted aesthetic that will help you find your rhythm in the mountains. Teaming up with rider Gray Thompson brought years of R&D and board testing; knowing what works and what doesn't. We knew what type of boards we could develop for the market that would fill a void in the directional, freeride/freestyle niche. What came next was a leap of faith and full commitment to enter the marketplace. We pooled our resources together and worked hard to find the best factories to partner with. What separates US from other brands on the market? Unlike many shaped snowboards in the market today, United Shapes boards are thoughtfully shaped and designed to ride in a unique way. We offer the consumer a new look at the way they ride, for instance, take the directional 153 Voyager out to the park - hit rails, hit jumps, and still be able to rip turns like you're on a race board. This kind of experience all on one board can change your whole perspective on snowboarding for the better. That mission, to experience the whole mountain in a new way - on one snowboard - is very rare in a market where brands try to differentiate their product into many complex categories. Our boards are more than fun shapes slapped on generic twin geometry. We seek to change the way you ride for the better. We draw inspiration from those pursuing exploration and a life of adventure in the natural world. Out of exploration has come so many amazing innovations and ideas - take space exploration for example and the shuttles and rockets that are beautifully and perfectly crafted. The great ocean, arctic and high elevation explorers, their motives, processes, gear, and feats are very inspiring. We aim to make the snowboard a vessel for anyone's exploration or time in the mountains. The experience of being out in the mountains, in the natural world is the essential part of snowboarding for us. No matter where you are, if you're outside, experiencing what nature has to offer - you are having a good time! It all starts sketching down ideas on notepads, fine tuning the lines, the vibe and purpose of the shape. It then becomes an intricate computer file that is sent to our factory to craft, while sourcing high-end materials. Once we receive prototypes from our state of the art factory in Asia, our team hits the slopes vigorously testing the shape in every and all conditions. We develop all of our own geometry and constructions, and will have our prototypes built in several different layups, each with tweaks to core flexes, carbon placements, and core profiles. From there, we've got a diverse network of riders and friends that put them through the paces to determine what goes into the final line. It’s a long road from concept to production, but you’ll feel the difference. Our boards are always undergoing subtle upgrades and refinements to make them as great as can be. United Shapes snowboards will be in select retailers this fall, available all over North America and Asia. You can find a list of awesome shops carrying our shapes on our website - UnitedShapes.us. What do you see in the future for US? We see many mountain ranges, thousands of pow turns and countless adventures in our future. To keep fine-tuning our product and our process and to collaborate with those who inspire us.